Their loan obligations can be more onerous than credit-card debt or subprime mortgages. Ronnie Franklin borrowed to pay his tuition at a for-profit college that advertised its success in preparing graduates for better jobs. That decision haunts him. Frustrated that his degree didn’t lead to work in electronics, Franklin — now a $12-an-hour housepainter — decided to go to a community college this year. He can’t qualify for a federal grant that would have paid the cost because he defaulted on $20,000 of his earlier student loans. Debt from a for-profit college education also shadows Christina Bergschneider and Michael DiGiacomo. Landlords rejected Bergschneider’s apartment applications more than 20 times because of her unpaid student loans. DiGiacomo, who works in a copy shop, forfeits 15 percent of his after-tax income when the Education Department garnishes his paycheck to collect on $30,000 in federal loans for two different for-profits. Students seeking to move up in life by getting a degree from a for-profit college are being trapped in a growing group of education debtors. Under federal law, their loan obligations can rarely be discharged in bankruptcy, making them more onerous than credit-card debt or subprime mortgages taken before the housing bubble burst. Along with blocking students from further education and access to housing, defaults can subject them to government confiscation of tax refunds and Social Security payments, as well as paychecks. Students at for-profit colleges, which rely on federal financial-aid programs for as much as 90 percent of revenue, carry the biggest loans in higher education. Bachelor’s degree recipients at for-profits have median debt of $31,190 compared with $17,040 at private, nonprofit institutions and $7,960 at public colleges, according to Education Trust, a Washington-based nonprofit research and student-advocacy organization. While currently enrolling one in eight U.S. students, for- profit colleges account for almost one in two federal-loan defaults, according to data released Sept. 13 by the Education Department. With the unemployment rate at 9.8 percent, many college graduates, from traditional universities as well as for- profit colleges, aren’t finding jobs and are piling up debt. Thirty-four million borrowers owe $713 billion, not including interest, in federal student loans, 11 times the amount of two decades ago, according to the Education Department. A total of $50 billion in these loans was in default in the year ended Sept. 30, twice the sum five years earlier. President Obama’s administration wants to curb rising default rates and the threat of student destitution by cutting off federal funds to for-profit college programs whose students have the worst loan-repayment rates and lowest incomes relative to debt. Rep. John Kline, the Minnesota Republican who will lead the House education committee beginning in January, pledged this month to block the plan, known as “gainful employment,” saying the measures don’t reflect an accurate picture of the quality of for-profit education. 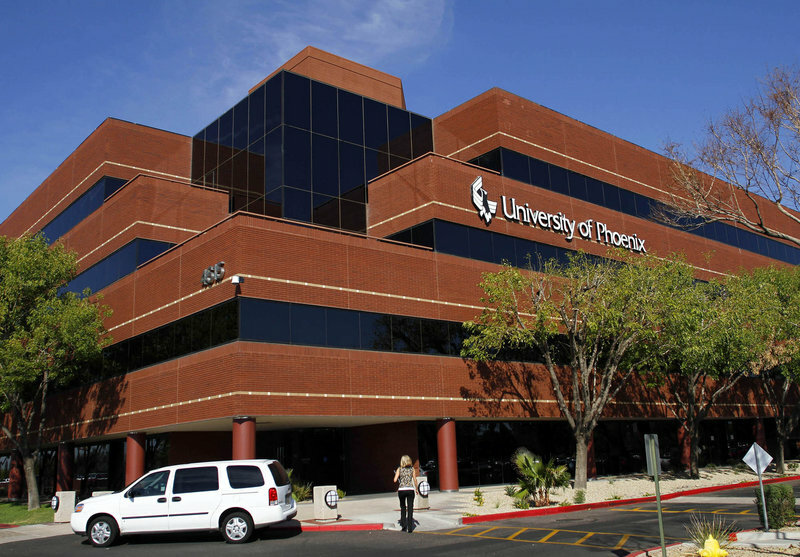 Shares of University of Phoenix parent Apollo Group Inc., the largest for-profit college chain by enrollment, rose as high as $97.93 in June 2004, as President George W. Bush’s administration eased regulations that resulted in more federal financial aid flowing into the industry. Apollo shares traded at $89.22 in January 2009 and have since declined by more than 50 percent as the Obama administration proposes more regulation and investors question the business model of the industry. Investors are giving some of the lowest valuations to companies with above-average default rates such as Corinthian Colleges Inc., according to Jarrel Price, an analyst with Height Analytics in Washington. Wally Weitz, founder of Omaha-based Weitz Funds, which manages $3.5 billion, said he is undecided about the value of the education provided by for-profit colleges. “The pressure to make the numbers and so on maybe means you make too many loans to student who can’t pay them back and admit students less likely to succeed,” said Weitz, whose firm owned 874,250 shares of Phoenix-based Apollo at the end of the third quarter. His funds bought the shares, a small holding, because of their depressed valuation, Weitz said in a telephone interview. For-profit colleges have higher student-loan default rates because they serve lower-income students, minorities, immigrants and working adults, Harris Miller, president of the Association of Private Sector Colleges & Universities, a Washington-based trade group, said in a telephone interview. The colleges have taken steps to cull students who can’t succeed, a move that will lower defaults, Miller said. The University of Phoenix began an orientation program designed to lower dropout and default rates. Washington Post Co.’s Kaplan Higher Education, the third-biggest chain, announced a program to let prospects enroll for a trial period and opt out without owing tuition. Taking a loan didn’t pay off for Franklin. The son of a nurse’s assistant and a sheriff’s deputy who didn’t attend college, Franklin dropped out of high school and spent two decades as a shoplifter and heroin addict, he said. After kicking his drug habit, he decided to turn his life around through education, he said. He heard about RETS Technical Center in Boston from a television advertisement. After graduating in 2000 from the 18-month electronics program, Franklin found himself unprepared for jobs in the field, he said. Classmates are now working as janitors, security guards and bus drivers, he said. Of RETS students who were required to start making payments in 2001, 23 percent defaulted on their loans within two years, quadruple the national average for all colleges. Besides defaulting on $20,000 in student loans and ending up as a $12-an-hour painter, Franklin stayed with his two sons in a homeless shelter last year, he said. Deciding he should study electronics from what he called a “reputable” institution, Franklin contacted Roxbury Community College in Boston this year, he said. Officials there told him he can’t qualify for financial aid because, under Education Department rules, students aren’t eligible if they are in default on government loans, he said. Only 14 percent of community college students take out loans, compared with 97 percent of for-profit students seeking an associate’s degree, according to Education Trust. Once in default on student loans, people often can’t pass the credit screenings needed to rent apartments, said Deanne Loonin, a lawyer with the National Consumer Law Center, a nonprofit advocacy organization in Boston. Department of Housing and Urban Development rules governing public housing, allow agencies to take credit histories into account in considering applications, Loonin said.